You may be surprised to learn that you can make your own soap at home with relative ease. The equipment and ingredients required are simple, and the method need not take very long to master. Making your own handmade soap at home will most likely save you money in the long run, and produce soap that rivals any shop-bought specimen. The mostly natural and naturally derived ingredients also mean that you're not loading your skin with unnecessary harsh chemicals. 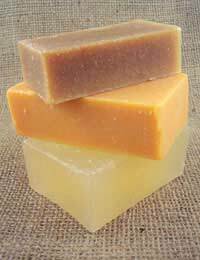 Homemade soap is therefore usually mild enough for use for those with sensitive skins. Soap is basically the result of a chemical reaction known as saponification. The success of your home soap-making endeavours largely relies on using uncontaminated ingredients. You should also be very mindful of irritants, and take the appropriate clothing and general safety procedures before indulging in your home chemistry! Safety glasses, an apron and ideally elbow length gloves should be the minimum safety measures undertaken prior to making your soap. Getting the ingredient measurements wrong could also mean that you've created a caustic soap - so take great care! If you haven't the time or inclination to make your own soap from scratch, there is another alternative. You can collect together scraps of soaps - the bits that are often too small to use on your body, but too large to just throw away - in a small plastic bag. Then simply add a little dribble of olive or sunflower oil. Then run the closed bag under hot water and gently mould together all the scraps of soap into one new bar. The soap can then be set or hardened in the fridge ready for use. This is a great way to recycle and reuse old bits of soap that are simply too good to bin. It also saves you money, and goes a little way to reducing landfill. This recipe uses Lye (also known as caustic soda or sodium hydroxide), which is a caustic alkaline ingredient. This means that if it splashes onto your skin, it can prove very irritable and in some cases, damaging. As a preventative safety measure, you can have a neutralising acid on standby - a bowl of lemon juice or vinegar should suffice. 1. Make sure you are safely suited and booted before handling the caustic ingredients, and that all children and pets are out of the way! 2. Gently melt the shortening (hard fat) and oil in your ceramic pot or pyrex dish (like a bain-marie). Once the fat runs clear, remove from the heat. 3. You will then need to mix and dissolve the lye with the water in the plastic or glass jug, taking care not to splash yourself. The lye will heat itself if left alone, so place a thermometer in the jug and place somewhere safe away from children or animals. At this point you can prepare any herbs or essential oils that you want to add later on. 4. The lye and water will heat up to around 50C (122F). However, the mixture will start to cool again, during which time you should periodically stir with the spoon. You are waiting for the mixture to thicken and for the soap to drip in a thin stream from the spoon. If it's ready for the next step, it should take a while for the stream of dripped soap to sink back into the cooling melted soap mixture. 5. Once you're sure your soap is dripping as it should, you can add a few drops of essential oil and stir to distribute the oil evenly. You should then rapidly pour the soap into your moulds that are on standby nearby! The moulds can be lined with a wet cloth. You can make preliminary cuts into the soft surface of the soap to make breaking the bars easier later on. 6. The moulds can be insulated with old towels to encourage saponification and left in a safe place for around 24 hours. After this time, with gloves on, the soap can be carefully removed from the mould and cut into bars with a sharp knife. The handmade soap should then be left to age for around 4 to 5 weeks. This is because until this time, the soap is still very caustic and there is no doubt that it will damage your skin if you try to use it too early. Tip: Remember to keep your rubber gloves on when washing up your equipment, as the ingredients used to make your soap are caustic and will damage your skin. Once your soap has aged you can always gift wrap it and present it as a gift to friends and family! Hi, I make soap for a little time, and it is quite interesting that you use solid fats as Trex and others, but do you know what are they?, because the SAP is different depending on the fat. Thank you.